Our model is sporting a casual hairstyle here that is cut short on the sides and back, while the top is left long enough to sweep back to create a voluminous hairstyle. This is an easy 'do to manage with regular trims every 4-6 weeks and needs product for shine and hold. 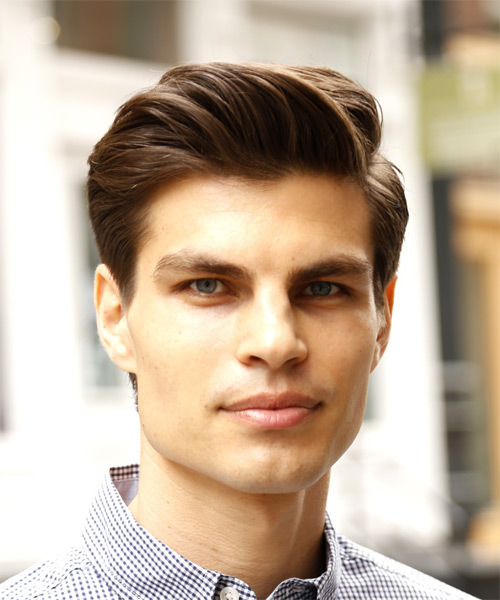 This hairstyle is ideal for men with thick hair that has some natural wave it in. Apply styling mousse to damp hair, using your palm as a measuring guide, and evenly distribute it along the hair shaft. Styling mousse will add hold and can help achieve better results. Using the corner of your comb and standing in front of a mirror find the middle of your left eye and then drag the comb straight up slowly until you reach your hairline and then continue back in a straight manner to achieve an even left part. A side part is great for longer face shapes because it creates the illusion of width. Using your blow-dryer, dry your hair using your fingers, separating the hair and allowing it to dry at the roots first then the mid lengths and then the ends. Making sure the roots are dry first will ensure that your hairstyle does not fall flat. A small radial brush is used on shorter hair types to add more body or in longer hair types to create curl. When selecting a radial brush, always use one with a pure bristle as this will not tear or damage the hair. To blow-dry your bangs you will need to take your brush and firstly make sure the section is no wider than the diameter of the brush. Next, place your brush on top of your head and under your section. Using your blow-dryer on a medium setting, blow-dry your hair from the roots, slowly working your way to the ends. Make sure to keep the blow-dryer in front of the brush at all times. Continue this step until the bangs are completely dry. Use your fingers and your moulding cream to pull your hair up and back while styling it to the right. Your suggestions and ideas are important to us. Copyright © 2000 - 2019 TheHairStyler.com Pty Ltd.